Sindu Enterprises We like to introduce our self as M/s.Sindu Enterprises and M/s.Sindu Building Equipments Limited, we are the leading, successful and specialized in the field of the hiring and supplying for more than a decade, a wide range collection of refined Centering Sheets, Column Shoe/ Boxes/ Props, Telescopic Spans, Adjustable Props, Builders Hoist (Material Handling Machine), Scaffolding Units, Heavy Duty Adjustable Props, Concrete Mixer Machine, Sand Seiver, Earth Rammer, etc. as our company success is concerned, technology, expertise and quality, which made us a well-known ON HIRE and supplier in Building Equipments at customer friendly prices. We successfully cater to the specific needs of customers and demands of competitive market by meeting international quality standards to offer optimum satisfaction to customers. All procured Industrial Centering Sheets are sent for stringent quality test, which is performed under the supervision of qualified and experienced professionals to ensure reliability, durability of products and supplied them at very cost-effective prices. We are supported by huge team of experienced professionals, who continuously work hard to design, develop and improve the product range as per industry and clients requirements. We make sure that the products are delivered within the stipulated time. Because of our stringent business policy, ethics and norms, we have obtained a strong client base in the market and threat to our competitors. We are well-established and reputed quality-oriented organization that never compromise with the quality of products and customers' satisfaction. 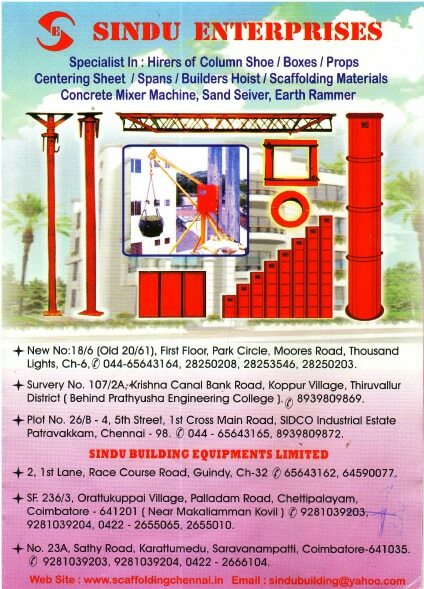 Earth Rammer Manufactured using quality raw materials and advanced machinery, these Earth Rammer have a sturdy construction and a compact design. The offered compactors are used for the purpose of reducing the size of waste materials or soil, by applying repeated impact on the soil. Further, its long functioning life and quality make it a product with high demand in the market. Low consumption of energy and cost free maintenance make it a highly economical product. Features •Diesel engine / electric motor •Reversible Plate compactor •Esteemed operational performance •Extended life span Specification •Compaction capacity: 6.8 tons •Impact force upto (approx): 3500 kgs •Vibration frequency: 2000 r.p.m •Depth effect: 16 inch •Travel speed: upto 66 ft.p/min •Gradient capability: upto 20% •Compacting plate size: 780mm x 620mm x 490mm •Working area: 5500 sq.ft.p/h. •Cooled diesel Powered: 4.4 HP • Crompton greaves electric motor Powered: 5 H.P. With the aim of providing best-in-class equipment, 1/2 Bag Concrete Mixer has been offered. These products are manufactured using qualitative materials and are offered with the assurance of optimum usage. We manufacture these products at our hi-tech infrastructure, leading to flawless characterization and durable features. Delivered within the promised time frame, these mixer bags are our valued offerings. Specification •Compaction capacity: 6.8 tons •Production capacity: 1/2 bag 5/3 CU.FT 150 litres •Power: 6 HP Air-cooled diesel engine (or) 3 HP electric motor •Bearings : URB , Nachi •Speed: 24 RPM •Material: Cast iron •Cone: Mild steel , 5mm thickness •Casting Drum : 20 mm •Tyres : Re built tyre with new rubber tube and used disc, hub and bearing. Commenced in the year 2014, A.N. Scaffolding Works has carved a distinct niche in the market. We are working as a sole proprietorship based firm. Location of our company’s head quarter is Hyderabad, Telangana (India). We are the foremost manufacturer of Scaffolding Cuplock, Construction Span, Centering Plate, Construction Accessories and many more. We also provide Fabrication Service. Offered products are precisely manufactured by our dexterous professionals.